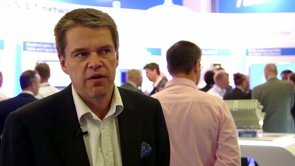 Teleste envisages a four-step evolution to next-generation cable networks, based on 1.2GHz/200MHz upgrades from 2015, DOCSIS 3.1 and CCAP upgrades from last year, distributed architecture and Remote PHY moves this year and finally, an evolution to the virtualised CCAP next year, according to Hanno Narjus (right), SVP of network products at the Finland-based technology company. Teleste, together with Cisco, has built a multi-vendor Remote PHY network for Telia using the AC9100Neo Remote PHY device and Cisco cBR-8 CCAP core. Video integration and the definition of network management systems, as well as how legacy HFC technolgy works within the Remote PHY architecture and how to ensure interoperability have taken a lot of working out. “This has been a learning journey for the whole industry,” said Narjus. Narjus said that operators had three choices when it comes to distributing video over a distributed access architecture. They can deploy a single CCAP architecture, a multi-core approach or to maintain a traditional video architecture with an overlay for data, he said. “There are no right or wrong choices. You have to look at your own legacy architecture,” he said. Narjus said that operators typically want to move to a single CCAP for video and data. However, this is really being decided on a “case by case” basis. Altice is deploying DVB-T in its cable network “so there is not choice” but to deploy an RF overlay, said Narjus. There can also be different migration journeys for VOD and linear video, he said. Luis Martins, head of cable access, Cisco, speaking at the event, said that broadcast had been kept separate in the past but there is now more interest in delivering video over IP to the Remote PHY device. Cisco said that some virtualised CCAP deployments would start to appear by the end of this year, but the evolution is complex and will take some time. Teleste launched its first Remote PHY node last year. This year it has launched a new compact optimised device at ANGA COM. Narjus said the DAN 300 is standards-based and future-proof to enable IP migration and Full Duplex DOCSIS. The device provides an evolution path by enabling an optional RF overlay for video services and out-of-band capabilities for legacy management services. Teleste is also launching enhancements to its Luminato digital headend to enable video distribution and the company is now building a service capability to help operators migrate to a distributed architecture and Remote PHY.